Patented "Twin Tooth" design of the Split-Chip advantage "bi-metal unique"
Starrett Intenss PRO-DIE band saw blade 64-1/2" x 1/2" x 0.025". This blade has 10-14 teeth per inch, for cutting sections over 1/4” to 1-1/4” thick. The regular tooth shape is the conventional tooth for general purpose sawing, straight zero rake. These blades fit the popular 4x6 band saw sold by Harbor Freight, Grizzly and many others. The variable tooth pitch reduces noise levels and vibration and cuts structurals, tubing and solids smoothly and quickly. Intenss PRO-DIE is the ideal general-purpose metal sawing blade. Intenss PRO-DIE band saw blades have bi-metal unique saw technology, triple tempered M-42 cobalt HSS teeth combined with alloy steel backing strip for heat, abrasion and shock resistance, longevity and chip clearing. Ideal for tool, die and mold steels, stainless and nickel based and non-ferrous alloys. Starrett Intenss PRO-DIE band saw blade 64-1/2" x 1/2" x 0.025". The hook tooth shape has a 10" positive rake for fast cutting of non-ferrous metals and non-metallics. This blade has 6 teeth per inch, for cutting sections over 1” thick. These blades fit the popular 4x6 band saw sold by Harbor Freight, Grizzly and many others. The hook tooth shape has a 10" positive rake for fast cutting of non-ferrous metals and non-metallics. Intenss PRO-DIE is the ideal general-purpose metal sawing blade. Intenss PRO-DIE band saw blades have bi-metal unique saw technology, triple tempered M-42 cobalt HSS teeth combined with alloy steel backing strip for heat, abrasion and shock resistance, longevity and chip clearing. Ideal for tool, die and mold steels, stainless and nickel based and non-ferrous alloys. Starrett Intenss PRO-DIE 64-1/2" x 1/2" x 0.025" bandsaw blade. This blade has 8-12 teeth per inch, for cutting sections over 11/32" to 1-1/2" thick. The regular tooth shape is the conventional tooth for general purpose sawing, straight zero rake. These blades fit the popular 4x6 band saw sold by Harbor Freight, Grizzly and many others. The variable tooth pitch reduces noise levels and vibration and cuts structurals, tubing and solids smoothly and quickly. The Starrett Intenss Bandsaw Blade is the ideal general-purpose metal sawing blade. Intenss PRO-DIE band saw blades have bi-metal unique saw technology, triple tempered M-42 cobalt HSS teeth combined with alloy steel backing strip for heat, abrasion and shock resistance, longevity and chip clearing. 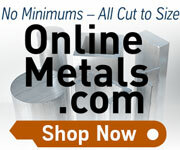 Ideal for tool, die and mold steels, stainless and nickel based and non-ferrous alloys. Starrett Duratec PH band saw blade 64 1/2" x 1/2" x 0.025". Made from carbon steel with a flexible back, Duratec FB is ideal for economical cutting on easy-to-machine ferrous or nonferrous metal and wood. It is for general purpose contour and straight cutting on a variety of machines. Starrett Intenss PRO-DIE band saw blade 64-1/2" x 1/2" x 0.025". Intenss PRO-DIE band saw blades have bi-metal unique saw technology, triple tempered M-42 cobalt HSS teeth combined with alloy steel backing strip for heat, abrasion and shock resistance, longevity and chip clearing. Ideal for tool, die and mold steels, stainless and nickel based and non-ferrous alloys. Sharp, black graduations on the satin finished bar, every .100"
One end has a 0.200” diameter contact. The other end has a pointed contact. Features an involute groove, providing a reliable seat for round work. Finest quality sasoned cast iron. Starrett levels are the finest levels available. Fits fractional thread taps from 1/16" to 3/16"
Fits fractional thread taps from 1/4-1/2"
Quickly and accurately locate working centers. Attachment snapped in chuck without removing collet nut. Spring tension on ball permits guiding point to true concentricity.